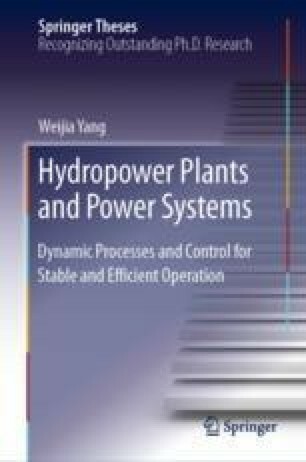 The stable operation of HPPs regarding rotor angle stability of power systems is studied in this chapter. In Sect. 5.1, a fundamental study on hydraulic-mechanical-electrical coupling mechanism for small signal stability of HPPs is conducted by Eigen-analysis. Considerable influence from hydraulic-mechanical factors is shown, and it is further quantified in Sect. 5.2: An equivalent hydraulic turbine damping coefficient and the corresponding methodology are proposed to quantify the contribution on damping of rotor angle oscillations from hydraulic turbines based on refined simulations. In Sect. 5.3, the quick hydraulic—mechanical response is discussed to support the results in this chapter. The engineering case of all sections is HPP 5.